Once Ralph and Vanellope find their way onto the internet after leaving the safety of their arcade, they’re met with all the same kinds of obstacles and difficulties real people deal with every single day when they log onto their phones or computers—pop-up ads, viruses, and other, less civil people who are browsing online. This is what makes Ralph Breaks the Internet’s fantastical settings so immediately relatable. It’s a version of the “internet” that you’ve never personally interacted with, but it’s immediately recognizable as being a fanciful take on a digital space we’re all keenly familiar with. 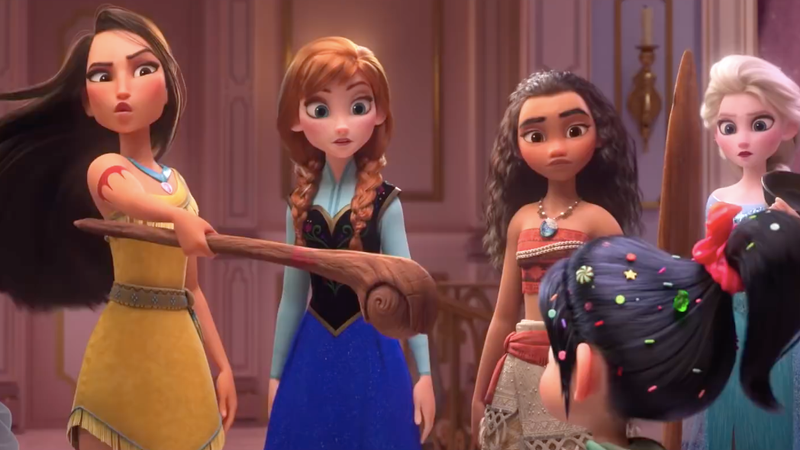 The squad of Disney Princesses™ who make a number of Ralph Breaks the Internet’s funniest cameos are some of the film’s breakout stars. Not for the roles they play in the story, but because seeing them all interacting with one another is extremely out of the ordinary. After correctly realizing that the internet isn’t always the best place for young people, Ralph reasons that it’s in Vanellope’s best interest to hang out somewhere safer—somewhere designed to keep people occupied and entertained within a well-maintained, walled garden of pleasantness. Even though neither of them has enough experience with the internet to understand the significance of the choice, Vanellope ends up jetting off to a Disney website where she’s introduced to the world of fan service, online quizzes, and countless other forms of interactive content all centered around the intellectual properties Disney’s accumulated over the years. On paper, this might sound a little humdrum, but Ralph Breaks the Internet realizes it as a kind of Disney World on steroids, where millions of people flock daily to lose themselves in all manner of activities designed to capitalize on their love of princesses and stormtroopers (to name a few). Sitting in the theater, I couldn’t help but overhear the chorus of voices calling out the names of characters and franchises that people in the audience recognized. Even though most weren’t particularly important to helping Vanellope figure out what she was looking for, their inclusion in the movie was easy to understand. Ralph and Vanellope driving around the web. What’s ironic is that in more than a couple of scenes, Ralph Breaks the Internet casts a glaring side eye at the role the internet has played in helping us cultivate hyper-consumerist identities online. The hordes of humans clamoring to buy things at eBay are simple, silly background characters who only serve to get in the way of the movie’s more sophisticated digital beings. The weird thing, though, is that those people quite literally are us, the audience, even though we’re meant to emotionally identify with Vanellope and Ralph. Disney’s made similar critiques of excessive consumption in the past with films like Wall-E, but the thing that sets Ralph Breaks the Internet apart is that the thing being so cavalierly consumed with little concern about consequences is Disney itself. Wall-E makes a point of letting you know that the remaining humans of the future are people who’ve been victimized by the Buy-N-Large’s corporate greed. Ralph Breaks the Internet, on the other hand, merely wants you to marvel at the incredible stranglehold Disney has on some of the biggest properties in film history. Disney wouldn’t be able to make a film like Ralph Breaks the Internet were it not for the ever-consuming titan of industry—a status that the public imbued it by coming back to theaters over and over again. It’s just odd to see the transactional, capitalist nature of it all transformed into a meta, cartoon spectacle we all apparently get a kick out of.